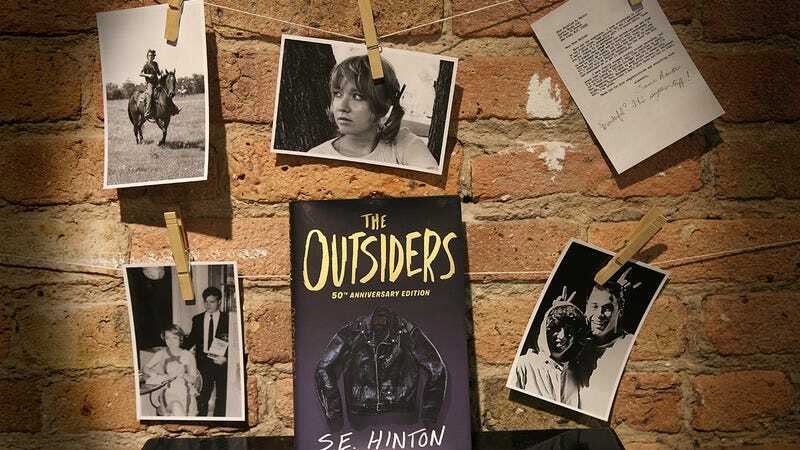 In 1967, Tulsa teenager Susie Hinton published her first novel, The Outsiders. The first-person narrative of Ponyboy Curtis discussed his brothers and friends in the Greasers as they faced off against the local rich kids, the Socs. The novel has never been out of print, having sparked a sense of identification with the first teenagers who read it, and every generation since. The book was also made into a now-legendary movie in 1983, directed by Francis Ford Coppola and starring seemingly every young actor in Hollywood at the time, including Matt Dillon, Ralph Macchio, Patrick Swayze, and Tom Cruise. The success of The Outsiders helped boost the popularity of Hinton’s subsequent books like Tex, Rumble Fish, and That Was Then, This Is Now, all of which were also made into films. For the 50th anniversary of The Outsiders, the author formally known as S.E. Hinton undertook a book tour to promote the anniversary edition of her most famous novel, and fortunately, The A.V. Club was one of the stops. Unfortunately, the video interview in our studio was unusable due to a microphone malfunction, but still wanting to release the interview, we’re publishing the edited transcription below. Hinton was invariably magnificent, offering us many wonderful stories from her legendary literary life. The A.V. Club: What is it like for you to still be talking about this book after 50 years? AVC: Absolutely. Hadn’t you just flunked a writing class when you started writing this book? AVC: She probably did. You were growing up in Oklahoma, and watching these social groups. Why tell the story from the perspective of a young teenage boy, as a teenage girl? SH: Well, I grew up with only boys. I was a tomboy. I couldn’t find anything in the female culture to identify with. What girls got to do was stand in the john, outline their eyes in black, and do their hair and brag about their boyfriend’s car. I didn’t want that. I wanted my own damn car. Even today, my men friends outnumber my women friends. So I think maybe my mind—I’m not saying I have a masculine mind, because god knows my husband does, and I have no idea how that works—but it’s just that I don’t find a lot of female characters as interesting. And, it’s the easiest voice for me. Another thing is, I figured, if I wrote this and said a girl was doing this stuff, which I was doing, nobody would believe it. It was very easy for me to switch over to the persona of a boy, and I’ve written from a male point of view ever since, just because it’s easy and I’m lazy. AVC: So these characters were based on actual boys that you knew and were hanging out with? SH: Loosely based. I couldn’t say, “This is who such-and-such is based on,” because I fictionalized everybody, mixed up their looks and personalities and so forth. But yeah, I knew the situation, being in a greaser neighborhood and hanging out with guy friends like that. It kills me when people say it’s a gang book. It’s not a gang book. I have no idea how organized gangs work, but I’m very aware of the social class warfare that was going on in my school. AVC: And you were growing up on the greaser side. SH: Yep. Then, when I went to high school, I got put in, nowadays what would be called AP classes. They called them college track in those days. So I was in a different group of kids when I was in high school. So I got to see both sides. I refused to identify with either one of them. I’ve always been an observer. There’s people who do things and people who watch, and I’m a watcher. I was very well aware of what was going on. I went to a huge high school, baby boomer. The senior class that I graduated with was 1,000 kids. That was the smallest class in the school. The bell rings and this mass of humanity, you have to try to find your way through to get to your next class. But you couldn’t have a lot of friends. You got there, and you decided what group you were in, or somebody decided what group you were in for you, and then you didn’t have any friends outside of the group. And I was watching these people obey all these rules—nobody said, “Where do these rules come from? Why do we have to do this? Why can’t we have friends in any group we want to?” And I just thought the whole damn thing was stupid. So I just was watching it. AVC: I recently reread it, and I immediately get there. Some of our commenters said they can still recite the first lines 50 years later. It’s so atmospheric. It really puts you in a place. After you finished it, how did you get it published as an unknown high school student? SH: Well, I’ve been writing since grade school, so I’d actually been practicing for eight years. I wrote constantly. The Outsiders was the third book I’d written. It was just the first one I’d ever tried to get published. But I just did it for myself. There wasn’t anything being written realistically for teens in those days: “Mary Jane goes to the prom.” I wanted to read it, and I always told kids that tell me they want to be writers, “If you don’t want to write it bad enough, so you yourself can read it, you’re not a writer.” It wasn’t like I sat down at 16 and thought I could write a book. I’d been writing for a long time. I just had closets and drawers of all my other stuff. One day I was talking to a friend at school, and she said, “My mom writes children’s books,” and I said, “Oh, I write!” She said, “Oh really, let my mom read it,” which she did, and she gave it to a friend of hers, who was also a published writer, but she had an agent, and she said, “Here’s my agent, send it to them.” I had no idea what was the difference between an agent and an editor. I had a name and an address. So I did send it to her. Marilyn Marlow of Curtis Brown did call me my senior year and said, “I’ve sold it to Viking. It was the second publisher that saw it, and it’s going to come out in a year.” Of course, I was just dumbfounded, and of course, excited. I got a contract on graduation day, which just blew graduation out of the water. Of course, the funny thing is, four years later, I got my contracts for That Was Then, This Is Now, the second book. I got those on my wedding day. I looked at the contracts and went, “Eh, this is nothing. I’m getting married!” I stayed with Marilyn Marlow as my agent until about 12, 15 years ago. I’m still with Curtis Brown. I know I’m supposed to have starved with rejection slips all over, but it didn’t happen that way. It went real fast for me. AVC: Everybody has their entry story to The Outsiders. Mine is that I hated my Catholic school so much. We had the worst nun ever, and the only good thing that she did was she read The Outsiders out loud to us in language-arts class. I remember at the end, when Johnny and Dally die, we’re all just sobbing—boys, everybody in the sixth grade—and it was amazing. And then of course I bought it and read everything you’ve written ever since. It’s been mentioned that you kind of had a writer’s block then after The Outsiders? You had such a high bar at that point. SH: Well, I had never thought about the audience before. When I wrote The Outsiders, I was totally unaware of an audience, since getting published wasn’t my big deal. My big deal was getting the book right. I mean, I wrote it through different drafts before the publishers saw it. All of a sudden, I’m aware of the audience, and everybody’s expecting me to do a masterpiece. I didn’t have a masterpiece in me. I was in college, and I was reading some good writers. And of course, when I reread The Outsiders, I magnified all those faults. AVC: That second book, That Was Then, This Is Now, probably saved me from ever trying drugs in high school or college. M&M’s drug trip with the head through the stomach and the colorful spiders… yep, nope. I don’t think I’ve actually reread it, I was so traumatized reading it the first time. What’s interesting between those two books is that in The Outsiders, the friends are family. There aren’t any parents around, they only have each other to rely on. Whereas That Was Then, This Is Now is basically about the dissolution of a friendship, between Mark and Brian. AVC: It was so powerful. Rumble Fish is really interesting, too, because it’s more narrow. It’s not about a wider cast of characters like the other books—it’s mostly just about Motorcycle Boy and Rusty James. SH: You know, Francis Coppola, who did the movie—and he and I wrote the screenplay—was the first person I ever talked to that understood the book. I mean, I’ve had teachers saying, “Rusty James displays these 12 points of, if you’re taking a perfect kid, might turn into a gang member.” I wasn’t thinking about that. I was actually thinking about mythology, and I’m just reading a lot of mythology, and I was thinking about people’s need for mythology. A jillion years ago, maybe Hercules killed a lion. You don’t know if it’s a baby lion, and old toothless lion, whatever kind of lion, but it’s gone down as, “Hercules killed this lion.” Hercules was a hero among men. People need their myths. They do need them, and the Motorcycle Boy realizes this. He knows he’s the neighborhood myth, and I think that’s why he chooses to rob a pet store, instead of say, a convenience store. Because everybody does that. It was the beginning of the neighborhood myth. SH: I did work. Francis and I wrote the screenplay for The Outsiders, no matter whose name you see on the credits. But anyways, I’d seen what Tim—he was the co-writer of the screenplay for Tex—had done with it. So I was pretty ruthless. I knew you couldn’t slow things down on the screen. You can’t give people big speeches. I’m in my 30s, and I come across some dialogue, and I think, “Ugh.” So I rewrote it, gave it back to Francis. He was fine with all the cuts, because I’m good at that, I’m good at editing. And he goes, “Susie, this line isn’t the same as it is in the book.” I said, “No, Francis, it’s better.” He said, “We’re making it for the kids. We want to use the dialogue word for word.” So that was my big problem with working with the man—he wanted to be true to the book. AVC: And it was your book, and you were like, “It’s totally fine to change it”? SH: Yeah, and then I got the cast. We had the luxury of two weeks of rehearsal. Francis had them all calling each other by their script names. They were so much fun. I felt so bad, because they’re these little kids. Tommy [C.Thomas Howell] was 15, who played Ponyboy. Rob [Lowe] turned 18. Matt [Dillon] had just turned 18. Emilio [Estevez] and [Tom] Cruise had turned 19. Ralph [Macchio] was the old guy at 20. I rehearsed with them. I felt bad. They had nobody who had their back. I mean, they were little kids. So I decided I would be their mom. Rob called me “Mom” half the time. They all came to me with their… they didn’t have any big problems, there wasn’t any cliques or backstabbing or any dust-up between them. They were all very cohesive, yet they were all so different. Every once in awhile, you’d get a whimper or whine here or there to take care of. They were sweet boys. I realized what a good mom I could be, because I could just nag and worry needlessly. I thought, “This is fairly easy. If I ever have a kid and he’s a teenager, it’s going to be a piece of cake.” Of course, when mine was a teenager, I realized the words, “I’m going to cut your lines” had no effect on him whatsoever. AVC: How did you feel about that movie when it came out? How did it stand up for you against the book? Was it an adaptation that you liked? So he went back and dug out footage that had been deleted and scrambled them back into another version, and then he later came out with that version. It’s called The Outsiders: The Complete Novel. It has all those scenes in it, including one of the ones I liked best, the opening scene when Ponyboy gets jumped and all his friends from the neighborhood come to rescue him. It’s the only time in the book or the movie you see them all together. Each of the actors had a minute, two lines, to establish their characters, and they did it so, so well. I was so glad to see that. And of course, Rob’s good scenes. So he’s the only director I ever heard of that recut a movie because fans of the book asked him to. AVC: At that time, Francis Ford Coppola was coming off of The Godfather movies, and then he’s doing your book. And you said you were in your 30s. Was that intimidating for you? SH: Not really. He invited me down. He was holding a local casting. He went around and tried to look for unknowns. I remember realizing he was a little nervous about meeting me. When I met him, I said, “You know, Francis, I did have one problem that you’re doing this movie.” He said, “What’s that?” I said, “The Godfather is better than the book, Black Stallion is better than the book. Are you going to do that to me?” And he just laughed. We got along real well. We were real close. We’re still real close. It’s like we can pick up where we left off at any time. Halfway through The Outsiders, he says to me, “We work well together. You got anything else I can do while I’m here? We got a crew, we got a cast, we can go right into something.” I said, “I’ve got this weird book called Rumble Fish, nobody gets it.” He gets in raving about Rumble Fish. “This is so weird, and we’re going to make it weirder. We’re going to shoot it in black and white.” He had it all in his head after one reading. He looks at me and he says, “Susie, you and I can write this on Sunday.” Well, we’re working six days on The Outsiders, 14 to 16 hours a day. We’re going to write this on Sunday? But we did. We had a couple Sundays. We had a workable draft. Then Tex came out. The publicity for that was mad. While we were shooting, still finishing up, starting to shoot Rumble Fish, the boys came back to do some reshoots for The Outsiders. At one point in my life, I was writing a movie, editing a movie, and advertising a movie, all in one week. Different movies. I got a crash course in movie-making. But I enjoyed it. I know I slept for six months after, probably. It wasn’t fun. It was miserable. AVC: The Rumble Fish shoot? AVC: A lot of strong characters on set there. SH: Oh yeah. Mr. [Dennis] Hopper. AVC: Oh yeah! With Mr. [Mickey] Rourke. SH: Mr. [Nicolas] Cage. Not a blast. Not in the least. Mr. Rourke, the crew was going to have T-shirts made up that said, “No wonder they killed him.” He was a pill. But he did a great job. I always say he did a great job. It was a hard part—he did a wonderful job. I shook his hand and told him so at the end of the shoot. I said, “Mickey, you did a really great job in a hard part.” Francis was standing right there. He said, “You mean, he did a really hard job in a great part.” One thing that set Mickey for me was he absolutely adored Francis. Just adored him. Okay, he’s a big pill. He doesn’t have to be my best friend. AVC: When we announced this interview, we got a ton of questions and a lot of comments for you. A lot of people just saying “Thank you.” “The movie and the book still have an impact on me.” “Growing up as a poor kid in the inner city, your book really resonated with me and got me interested in other books and forms of writing. Including Robert Frost.” The Robert Frost line is the one that most people remember from The Outsiders. Was that something that you were reading in your class in high school? SH: When I was writing The Outsiders, I would just pick up bits and pieces around school and write them into the book. In my much-maligned creative writing class, I just picked up a magazine and read that poem, and thought, “Oh, this is what I’m trying to say with The Outsiders.” I couldn’t define it, but I went in and wrote it into the book. And of course, that phrase “stay gold.” I just hit a penny. SH: Yep, a lot of them say that. AVC: What other things do you see? SH: One of them had a tattoo of the whole opening line. It took up a lot of arm space. AVC: What’s the best interaction, or one of the best interactions you’ve had with a fan? AVC: We touched on the fact that you were a greaser, the audience that you wrote for was yourself, and why you wrote as a teenage boy instead of a teenage girl. SH: If I’d written it about girls, when it came time to shoot the movie, and I spent months surrounded by beautiful girls, it wouldn’t have been near as much fun. AVC: But that’s what’s interesting. Rereading the book, Dallas Winston, in the book, is a blond bad boy. Matt Dillon—who you obviously have a strong connection with, he’s in three of your movies—is not how he’s described in the novel, but he completely embodies that character. SH: Absolutely. People say, “Well, Matt wasn’t a blond.” And I’d say, I’d rather have the right actor than the right hair. [Than do] something like they did to poor Colin Farrell and dye him, bleach him blond for Alexander. But no, they embody the spirit of the character, and that’s what really counted. And of course Ralph, he looked just like the character. Ralph showed me his book report from seventh grade on The Outsiders, and it said, “If I ever get a chance to be in the movie, I have to play Johnny.” Francis did this weird auditioning thing in New York. He had them all play different characters and mix each other up. At one point, when they had Johnny playing, Ralph told me, “I was so mad, I don’t want to play this. I have to play Johnny. I have to play Johnny!” He got the part. Francis thought they’d have fun with it, but they didn’t. AVC: Yeah, they had an emotional connection to a certain character. You don’t want to go in for Johnny and read for Two-Bit, someone who’s entirely different. One thing that I’ve always loved about your books is the character names. Ponyboy, Sodapop, Cherry Valance, Rusty James. Where did those come from? AVC: You’re also a Supernatural fan. SH: Oh yeah, I love Supernatural. Eric Kripke turned out to be a friend of mine. After I wrote him a fan letter, he invited me to visit the set of The CW show Supernatural. So I visited the set and had a really good time. When I was leaving, I got so many invitations to come back. Now I go about twice a year, and have for nine years, to visit the set of Supernatural. Most of the crew stayed the same, the actors are the same. So I watched them grow up. It’s really fun. They treat me between royalty and family, which is very nice. I take the crew out. I go in with the director and come back to the hotel with the director. But I love the show. I think it’s great. AVC: We can’t thank you enough for coming in for The A.V. Club today and joining us. Nowadays especially, people are always like, “Well, I’m just one person, what can I do?” I was thinking about that with you. You were one person, one teenager, and you basically created the YA genre of fiction and these books that have affected generations and continue to every single year. SH: Let me just say this about The Outsiders: I love it when people write in and say, “I didn’t like to read, and then I read your book, and I realized I can like to read.” Because a lot of them think they physically can’t finish a book. But the letters I get saying “You changed my life” scare me, because who am I to change anybody’s life? So this is the way that I’ve learned to deal with it, because it’s all over the world and I get the same letters from people all over the world: that The Outsiders was meant to be written, and I got chosen to write it. It’s the message, not the messenger.